404 error pages are the result when a server cannot access the desired URL requested by the client, because the URL no longer exists on the server. A 404 error is comparable with sold-out items in a shop, or an old address from a school friend who has since moved away.If you regularly surf the web, you’ll have definitely seen the phrase “Not Found. The requested URL /xyz.htm was not found on this server,” a few times. This is the standard text displayed when a server can’t find a particular URL. If a page has moved: You have decided to transfer your domain. Generally, old URLs should be redirected to a new site with a 301-redirect. However, if URLs are forgotten, this leads to an error message in the form of a Status Code 404. URL restructuring: There are several reasons why URLs change. For example, a renaming of a directory can make URL changes necessary. If the internal links aren’t adapted accordingly, this can lead to a 404 error message. The same applies if an external website links to a page that no longer exists. Deleting URLs: a classic 404 error occurs with deleted pages. This can happen either by accident or intentionally, if, for example, a product is no longer available in an online shop. What Happens if I Don’t Configure a 404 Error Page? If a 404 page isn’t created, the server can’t provide an adequate response for a resource that isn’t found. This isn’t good for two reasons – firstly, users don’t know why the URLs don’t work and have a negative experience with your website. Secondly, the Googlebot want to access a non-existent resource, but does not get the correct status code 404 or 410 that this URL is no longer available. In both cases, Google will send a negative signal. This makes it all the more important to create a 404 error page. Another possibility can be the 301-redirect to a homepage. Even if this variation is usually chosen by big brands such as Espirit or Airbnb, this leads to so-called soft 404 pages. You’ll find out what this means in the last paragraph in this article. For a 404 page to be displayed, a simple entry in the .htaccess file will suffice. This is then supplemented with the following post. Translated, this means, if there’s a server request for a URL that is no longer available (Error document 404), the following page is displayed. Of course, you should create a corresponding page on your domain. Depending on the type of CMS, such pages are usually already available as standard. It becomes quickly clear that it is not only important to display 404 error pages, but that they should also be designed appropriately, because such a 404 error page will mean that the visitor will either leave the page immediately and return to the google search results, or close the browser completely. Both variations are bad for your website. 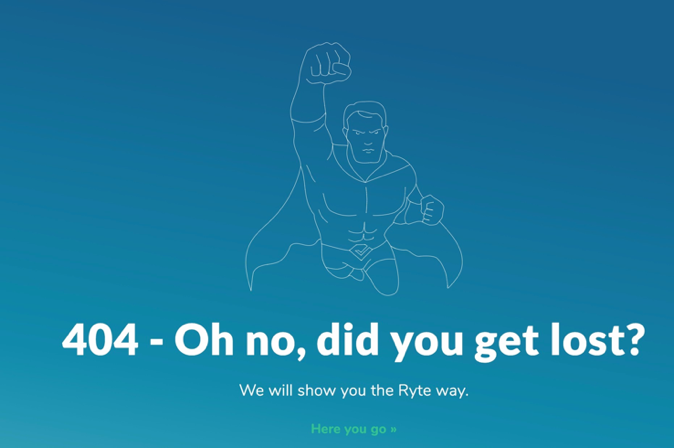 That’s why you should think about the following tips for good 404 error pages. Who wants to get stuck in a dead end or stand in front of empty shelves? If a visitor comes across a 404 page, you should firstly convey to them that the desired page is no longer available. The most simple way to keep your users on your website is referring to the homepage. Even if 404 errors belong to the “natural” characteristics of a website, you should regularly check your website for possible error codes, firstly so that you can be sure that all important URLs of your website are reachable with a browser, and secondly, a noticeable accumulation of 404 errors can indicate possible problems either after a relaunch or after restructuring your URLs. 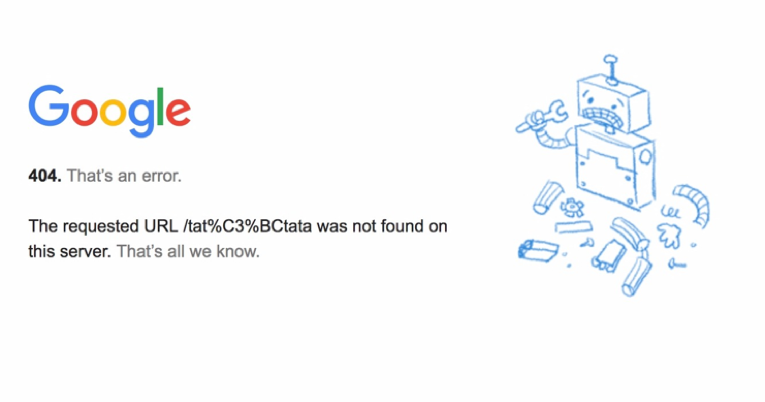 If your website is stored in the Google Search Console, you can find the report regarding 404 errors in the menu “Crawling errors”. Choose the tab “Desktop” and click on “Not found”. Then, all 404 errors that are conveyed by Google are displayed. When analyzing these key figures, note that the data is partially generated by comparing the URLs stored in the Sitemap.xml. This means that 404 errors that have already been corrected can be displayed here, or URLs that are no longer present in Google’s search index. Often, 404 errors appear in the list suddenly even though you have already noted them as fixed. That happens because Google crawls each website multiple times. A possible solution to this is the response code 410. However, you should only use this if you’re sure that the page will never be required again, as 410 involves the irreversible removal of the page. If you apply the correct measures, all soft 404s should disappear. An accumulation of these errors is, however, not a problem for Google. In the Google Search Console, you can mark the correct 404 errors and accordingly convey these to Google. With one click on the red bar with the header 4xx (not found), you can see all URLs which lead to an error page. What Do Soft 404 Errors Mean? A “soft 404 error” refers to when a URL requested by a client does not exist on the server, but the server returns a different status code. Whilst 404 errors regularly occur on websites and don’t influence rankings negatively, a soft 404 error can have an impact. This is because Google is essentially “fooled”, and the URLs might be indexed doubled, or the crawling will be impeded by the soft 404 error. 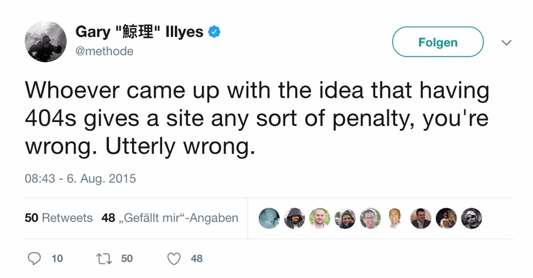 In this context, it is also important to note that non-existent URLs which are redirected to the homepage via a 301 redirect are evaluated as soft 404 errors by Google. 404 errors belong to surfing on the web, just like typos in texts or sold out products in shops. If your 404 errors are accumulating, you should definitely check your server configuration or your internal links. Maybe there are a few typos there, or ‘old’ URLs after a relaunch. It is much more important how you deal with these errors, and that you store the appropriate error page on your server, because with an appropriately designed error page, you ensure that visitors don’t leave your website straightaway when they don’t find the desired URL. Published on 10/27/2017 by Eva Wagner. (Full disclosure- I work for Cludo).